We’d love your help. Let us know what’s wrong with this preview of In My Father's House by Kwame Anthony Appiah. To ask other readers questions about In My Father's House, please sign up. Can someone summarize or review for me chapter 9? Modern Africans find themselves at the juncture of several worlds: As Basil Davidson might have noted, revolution, episodic nationalism, and postcolonial debacles have cast a pall of chaos onto an already historically chaotic field of peoples. The philosophies of Europe, the roots of tradition, African nationalism, Pan-Africanism, racial, tribal and ethnic solidarity, and a modernity which seeks to unleash individualism all come into conflict when Africans attempt to assess the problems they face, and detail solutions for these problems. Kwame Antony Appiah calls African thinkers to take up this important work, and he offers several assessments of these problems and possible solutions in his book. He believes that a better basis for solidarity in Africa is needed to replace decaying philosophies of negritude, and he discredits Pan Africanism's ability to fulfill this role. 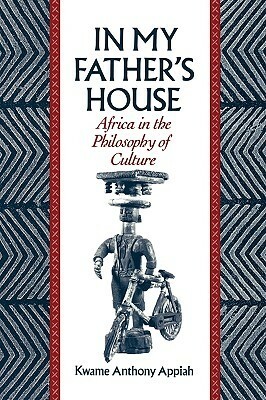 He addresses the question of what African philosophers should be preoccupied with, and whether, in their seeking to establish, unify, or recreate cultures, African philosophers can really draw upon philosophies and identities unique to Africa. The importance of an "African" identity has emerged since colonialism, and Appiah questions what such an identity should be founded upon, using Wole Soyinka and his own father Joseph Appiah as examples of intellectuals at work on the question. After a reading of Appiah's book, I question whether an African solidarity can be usefully articulated. Can inclusive, constructive and accessible modern culture be derived in a continent-wide scale, with some collective experience as its sourcebook? Perhaps the question rides on whether tradition is truly expendable, although so far it has apparently not been expendable (although it has proven malleable). Appiah's arguments in favor of reexamining what it means to be African, while he has labored to disassociate them from the Pan-Africanist agenda, seem unsure on the issue of Pan Africanist hopes. Pan Africanism, whether informal or economic, seems more than mired in implied racialism - it seems to ignore the idea that there is a need for modern African nations to promote overture to the world, rather than aggrandized protectionism, which invariable carries with it repressive nationalist agendas. The reality is that Africa is dependent upon its ties to the rest of the world. I believe that Appiah would argue that any "Africanism" is not useful as a method of affirming culture, either, precisely because to be simply "an African" implies such a tremendous negation of one's own past. This book, for the density and complexity as well as honesty of its inquiry, should be seen as a sold introuduction to what makes Africa so problematic on the level of identity and solidarity. The existence of an "african" identity can no longer be ignored. Appiah finds all the roots of this identity and gives them rigorous criticism in light of his own personal view of Africa as well as a solid reading of African philosophy, social science and history. Kwame Anthony Appiah successfully describes the difficults involved in relating lived experience in Africa with the globalized agency of Africa as a group. Without hammering the post-colonial apparatus too heavily, Appiah navigates the difficult area of defining what makes Africa Africa from as many points of view simultaneously. For Appaih the post-colonial condition is characterized by a variety of competing identities, groupifications from tribal, regional, racial, national, ethnocentric, rel Kwame Anthony Appiah successfully describes the difficults involved in relating lived experience in Africa with the globalized agency of Africa as a group. Without hammering the post-colonial apparatus too heavily, Appiah navigates the difficult area of defining what makes Africa Africa from as many points of view simultaneously. For Appaih the post-colonial condition is characterized by a variety of competing identities, groupifications from tribal, regional, racial, national, ethnocentric, religious, eurocentric and otherwise. All of these necessitate that the individual successfully navigate as many areas as possible in order to figure out who they are. Identity is destablized because after we reject nationalism as a modernist aesthetic derived from european identity of the 18th+ centuries, what have we got to replace it with? In post-colonial countries, there is a harsh identity that the educated elites begin to have problems with creating -- as their uneducated peers do not have access to the same historic basis to define themselves. Yet having a historic basis means losing the very centeredness of those "good ole days" when we were young, and life seemed very clear and stable. We experience some of this daily, in non-colonized countries as well, but our sense of legitimacy is different. The problem of post-colonialism is that all groupings of identity are competing and yet equally legitimate, in some sense. One can't deal with the world and completely ignore how the world sees one. The problem is complicated by the fact that many Africa groups do not identify with one another, coming from incompatible worlds, speaking a variety of incompatible languages with incompatible customs. The epilogue Appiah provides detailing his father's identity and how his father's death presented a complicated problem dealing with different competing sensibilities of how to honor the man and yet submit to the variety of powers that be. Did we read this in high school? I read part of it recently and had very strong deja vu, but could not imagine where I would have encountered it before except in high school. Anyway, the part that I read recently was awesome, even if it did seem somewhat dated. Weird how something written in 1992 could already be dated, but I guess that is what happens when you write about race and post colonial politics. A difficult read due to its provocative nature and technicality as in arguing from various fields of knowledge. Kwame Anthony Appiah nevertheless persuasively crushed the foundations of my knowledge pertaining to my identities as an Akuapem, Akan, Ghanaian, Afrikan and Human. He convinced me to seek new meanings for these labels having at the back of my mind that "there are no races, only cultures." The ending of the book, novel-like, shows the nature of feuds amongst the abusua "family" of the Ak A difficult read due to its provocative nature and technicality as in arguing from various fields of knowledge. The ending of the book, novel-like, shows the nature of feuds amongst the abusua "family" of the Akan especially when one passes away. Most importantly, it showcases how identities can conflict in the case of his fathers burial. Brilliant, insightful and beautifully written. Oh snap! Ontological Afrocentrism, you got served!